I love poetry. I like reading lines from other people’s minds, all the time. Today, I learned of poetry from a computer’s mind. Yes, an inanimate object making animate words into lines of a poem. 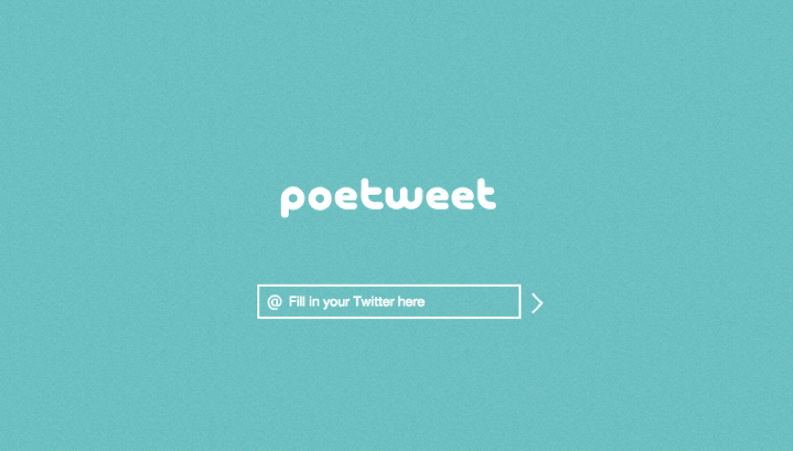 All you have to do is enter your Twitter handle, choose between a sonnet (14 lines), a rondel (French lyric of 2 stanzas of 4 lines, last one of 5), or the esoteric indiriso. Isidro Iturat, a professor of Spanish literature from Buenos Aires created this new standard. Indriso is a poem formed by two terzains and two one-line stanzas (3-3-1-1), with free use of the number of syllables in its verses. You win & Merry Christmas! Dead & she is the only suspect. Well, these poems may not make much sense, but the poems tell a story, my Twitter story. Now I love my Mac even more. Have a great weekend, create poetry and have some fun. Interesting! I think all my poetry would be xrated and they would shut down the program lol Only kidding.